If you ever need to reinstall software on your pc, knowing the software product key or keys is something you MUST KNOW unless you plan to pay for the software again. Today’s post will go over 2 free software programs that can retrieve product keys that are currently installed on your pc. Like was already said, sometimes you do have a product key sticker but it’s so faded that it’s the same as not having one on your pc. So what do you do, well there are numerous options out there for key finder programs, many of those options cost money $$$. The 2 options we are going to review in today’s post are Keyfinder from The Magical Jelly Bean and ProduKey from Nirsoft. For starters, You can download the software from magicaljellybean.com. On the page you will find 2 listing and 2 download buttons. The listing on the left side is the free version, and for most people that’s all you will ever need. So click on the left download, and run the installer program. Once installed, it’s very simple. Just run the program, it will scan your pc, and it will show you a window with all the programs it can find and the product key information. (As seen below). For record keeping you should copy or screenshot all of the information provided, in case you need to reach out to the publisher (IE – Microsoft) in the future. For reinstallation, the CD Key is what you need. 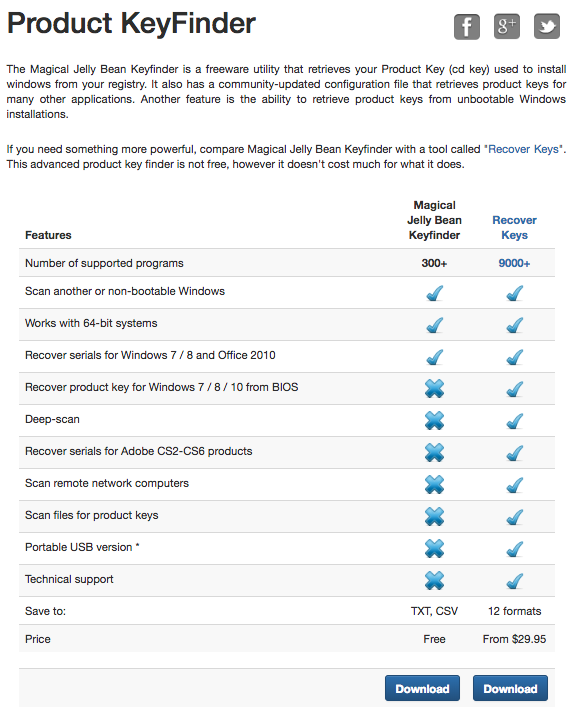 The second product key finder program is Prodkey and can be downloaded from the Nirsoft website. When it comes to the Nirsoft download, you may see various links, starting on the top of the page, but the link you are looking for is Download ProduKey with full install / uninstall support which can be found about 3/4 of the way down on the page. NOTE: The links on the top of the Nirsoft page will take you to a pay version that you don’t need. Once you have ProduKey installed, just click on the program to run the scan. 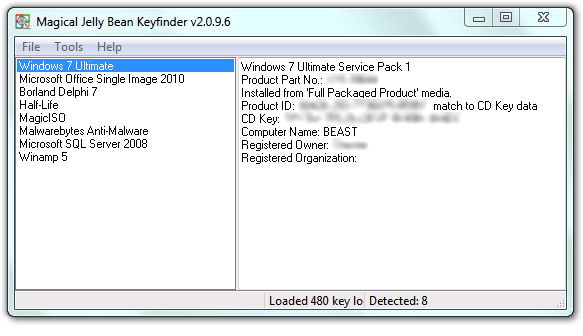 Once the scan completes, the program will list all software installed with its product key. Both programs work for Windows XP, Windows, 7, Windows 8, Windows 10 as well as Microsoft Office and other 3rd party programs from major vendors. Both programs are keyfinder applications. Neither program generate product keys, they can only tell you the info for keys that are already installed on your pc. Both programs look for already installed product keys on the pc. They can NOT get key information from CDs, as no CDs have product key information within the install files. If you have Windows 10, and you got Windows 10 via the free Microsoft upgrade that ended earlier in 2018, or if you purchased the Windows 10 upgrade via the Microsoft store online and downloaded the Windows 10 install, then you don’t have a product key you have a digital entitlement license. In that case you don’t need a Windows key, as long as none of the hardware on your pc has changed, Microsoft has license certificate on record that ties to your hardware and it will provide the license automatically during reinstall. To see if your Windows install is a Digital License, go to settings -> Activation (of left side) and then look under activation. It will say either product key or digital license.